Call Today For A Free 30-Day Trial. No Credit Card Required. Our Dental Website Live Chat Operators Monitor Your Website 24 Hours a Day, Helping You Convert New Patients While You Sleep! You may be looking at ways to make your website more dynamic and productive. 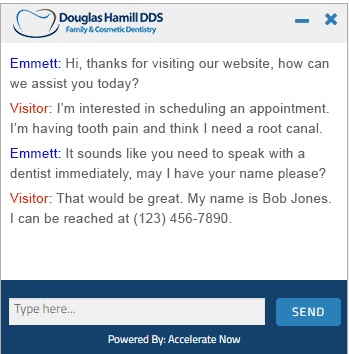 One easy way to make a dental website more dynamic is by adding 24/7 live chat operators that engage your web visitors in real-time. Today, website visitors want instant gratification and engagement, regardless of the time of day. Research shows that many potential new referrals visit dentist websites after hours. Therefore, you want a live chat service that will monitor your website 24 hours a day. Immediately following each live chat session, we send you an entire transcript of the conversation for easy follow-up and appointment scheduling. Adding live chat operators to your website can improve your lead capture rate by as much as 40%. Pricing: Our SEO clients receive our 24/7 live chat service at no additional cost. If you want to add our dental website live chat service to your website as a stand-alone service, pricing starts at $300/month. Adding a live chat service to your website will help you engage your visitors and bring in more business. Our affordable dental website live chat service is much different than an automated software application. If you want to discuss the differences between automated live chat software and real live chat operators, please give us a call. We would love to help you understand the differences so you can make an informed decision. We live in the age of instant gratification. When people go to your website, they want instantaneous engagement and support. Because the majority of consumers prefer that businesses are either open or at least able to assist customers at every hour of every day, our live chat operators monitor your website 24 hours a day, 7 days a week. When someone comes on your website, our live chat operators engage and assist your visitors and capture valuable lead information for quick follow-up. Emergencies do not always arise during regular business hours, and whether an office is open or closed, our live chat operators are always online and ready to take any questions from potential clients. The instant gratification that a live chat provides means that a potential client will be less likely to seek help from a competitor. According to a recent study by customer service software company Zendesk, 42% of online customers favor a live chat feature because of the immediacy that the feature offers. Zendesk further reports that live chat outpaces e-mail, social media, and phone calls in customer satisfaction, with 92% of customers who have used live chat offering positive feedback and reviews. Because almost two-thirds of online customers are more inclined to return to websites with live chat than to those without the option, plus the fact that more than three-quarters of Internet users will forgo using sites without a live chat feature, the minimal expense of adding and maintaining live chat on a website far outweighs the potential loss in revenue. Our live chat operators are all based in the United States and are fluent in English and Spanish. We fully customize the design of your chat window, and tailor your messaging to your specifications. Whether potential patients are simply asking about the business hours, or want to know where to find information on your website, our live chat operators can quickly and effectively answer all of their questions, and point them in the right direction. If the customer has a more complicated question, the live chat operator will collect their contact information and let the visitor know that someone from the office will be contacting them as soon as possible to address their concern. Immediately following a live chat on your website, you will receive a complete transcript of the chat conversation, along with the contact information for easy follow-up. If you want to learn more about our dental website live chat service. Contact us today.